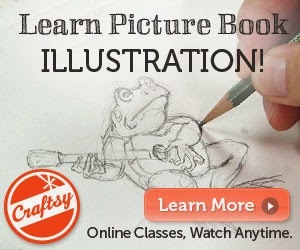 Today we are very happy to bring to you... a knitting book giveaway! We first met one of Rebecca Danger's cute monsters last spring at our local yarn shop. We hit it off right away. Fastforward several months... and we met Rebecca in person at TNNA and had a great visit together! She was in the kind company of Mr. Danger, who is really very nice even though his name might sound a little scary. Rebecca was at TNNA launching her new book, and so we were, so it was an exciting time for both of us! and Hugo, the Couch Potato Monster. I think Cecil the Computer Monster might be our favorite! You can view all of the fun patterns here on Ravelry. And you can keep up with Rebecca Danger here on the web. And... you can win a copy of this fun book here on our blog! Simply leave a comment and a way to contact you (via email, web, blog, or Ravelry) and we'll pick a winner within the week! If you send a friend over from facebook or twitter to leave a comment, let us know so we can enter you again! Oh, and remember to visit Rebecca's blog post about our new book, Freddie's Blanket, to enter to win a signed copy! Comments are now closed, thank you all for your kind words about Rebecca's fun new book! And congrats to Laura the winner! I love Rebecca's patterns! I would love to be entered for the giveaway. I love love love her little monsters. I would love to win this book. Thanks for the generous giveaway. I've just this week been browsing through Rebecca's patterns, trying to decide where to start. I've been eyeing Rebecca Danger's monsters for some time. But I could not pick my favorite because they are all too cute! Among other things, their little belly buttons are what I love! Oh, I've wanted this book for a while! I saw some of them knitted in Knitpicks Chroma and just fell in love! Her monsters are such fun! What a great opportunity! Thank you! You are so right, Cecil is a great computer monster. All are so cute. Crossing my finger that I'll win. I'd love to win a copy of that book! I would love to win and knit a monster for my friend's baby! Oh my gosh, those are so cute!! They'd make great gifts for my nephews! Dot is my favorite....somehow she reminds me of my cat. It must be the poochy pink tummy! I'm knitting one of her free patterns right now and it is so cute! I'd love the book. Monsters for everyone! Love the mix of books and knitting! LoriAngela on Rav. 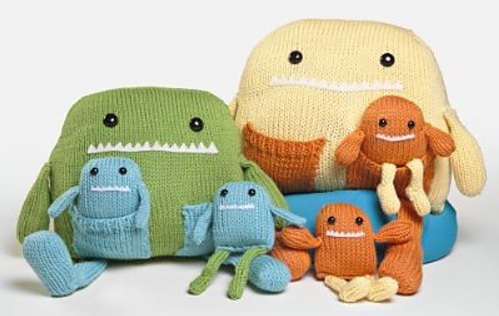 I want to knit ALL the monsters!! So cute!! I adore these monsters, they are so cute! ...and all of them, really. (: Great contest, I have some of Rebecca's Etsy paterns, and this book looks wonderful! Ooh, I've been eyeing this book for a while now, I love her patterns!!! Her patterns are adorable! I've bought one her patterns before to knit for a friend. I've been eyeing this book and waiting for the opportunity to pick it up... the monsters are so cute!! Awesome giveaway! I love all the patterns but I think that Toothy Joe the Mailbox Monster is my favorite pattern in the book. I hope I'm WINNING! I just love those monsters! Aw! What cute little monsters! I'd love a copy of her book. Her monsters are so cute. I'd like to knit one for my niece. My girls love these monsters and so do I. They are too cute. These would be awesome (both for me and my 3 year old nephew). 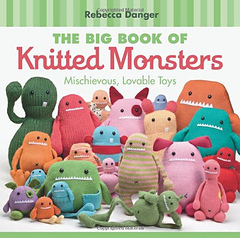 I love Rebecca Danger's monster patterns and have a couple in my collection but not her wonderful book. This book is on my list of must haves so it would be exciting to win it. I found your blog on Rebecca Dangers blog and thought I would hop on over. Fingers crossed I win!! I love them all! thanks for such a great contest! I just LOVE her patterns! So creative and fun!!! I've got my fingers and toes crossed! These monsters are such interesting people! Wow! I love knitting toys! And Rebecca's monsters are just adorable! My Ravelry id is prymnumber. I love Cecil the Computer Monster too! They are all really cute, no matter how hard they try to be scary. Oooh, I fell in love with these patterns during Malabrigo March. I can't wait to make a few of my own. 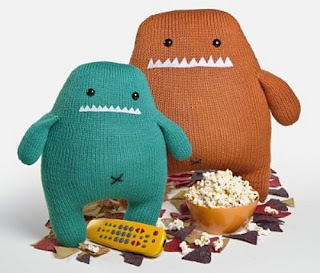 I <3 these monsters and would love to win the book! I really like Dot the Dress Up Box Monster. I saw this book this afternoon at a yarn shop. The monsters are adorable! I wanted to get it but I had already spent more than I had budgeted! I'm sure you all know how that is! I came over from Rebecca's blog and am so happy to have found a new blog to read. I am having a hard time deciding which one I love the most. If I had to choose I would pick...hummm...Dot with her cute ears and keen fashion sense. ;-) LOL! So cute. 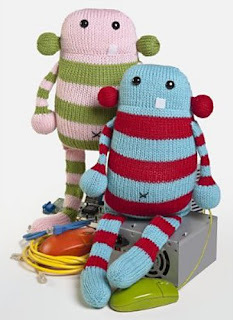 Love this book..Can see making some of these darling creatures for my grandchildren to play with. G'day! I fond your blog and bpols through Rebecca's blog and am so glad I have discovered your gorgeous books! I live on a wild Australian farm and we have platypi living in our river, so I adore your beautiful illustrations of this cute intriguing animal! Would love to win a copy of the dangerous danger book as I'm an avid knitter too! I love Claude the closet monster, mainly because that was the name of the "monster" in MY closet as a child! Seriously cute. As a grandmother of 3 boys, these would hit the spot! Give me a number and roll the wheel, I'd love to win the monster book. I can think of several kids who would love to receive them. aww! I did the robot Rebecca designed for valentines day, and he turned out so awesome, I have to make more. would totally love to win the book- but I will have it soon either way! thanx for this giveaway and thanx for Phoebe - my daughter is a mouse fanatic! 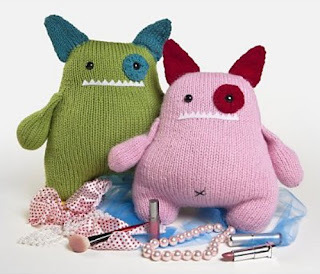 Fabulous, lovable monsters! Thanks for the fun giveaway. :) My sister-in-law is pregnant, so I'll soon have someone appropriate to be knitting critters for! They are all adorable! I like: Petunia the Patio Monster, although we could probably use a Housework Monster and a Laundry Monster around here. So you think that they would inspire those tasks? Lol. Love all of these patterns but cecil the computer monster is definitely my top favorite. Oh how I would love this book. I love all the monsters and would love to knit a few for my nephews! I love Rebecca's patterns! and would love to be entered for the giveaway. I've been eye-ing that book for a while now, would love to win it and make some of the monsters for my little niece and nephews! Ooh, I've got this on my Amazon wish-list! I love Rebecca's monsters! I love her monsters! Penelope is still my favorite but I love Leila, Lydia, and Lucas the Momma and Baby Monsters because of the pockets for the babies.